Embroidered Dragonfly with intricate black work detail on a all cotton tea towel and personalised with a name or little message of your choice. Embroidered Dragonfly with intricate black work detail on a all cotton tea towel and personalised with a name or little message of your choice. 100% cotton tea towel hemmed on all the sides. A good size tea towel at 52 x 72cm. Embroidered Dragonfly with intricate black work detail on a all cotton tea towel and personalised with a name or little message of your choice. 100% cotton tea towel hemmed on all the sides. A good size tea towel at 52 x 72cm. Choose from natural cotton, white cotton or upgrade to a pure linen tea towel. Choose a thread colour for the text and the letter font style you prefer. You can have any name or little message! Black Dragonfly motif and text is sewn towards the bottom of the towel so it can be folded over a oven rail. 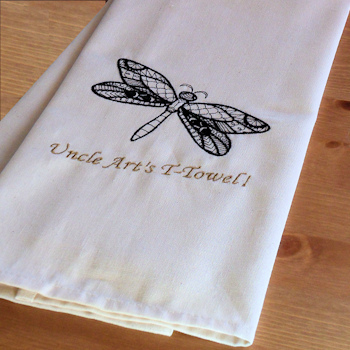 This Dragonfly tea towel makes a good gift for Anniversaries, Weddings and birthdays!